Are We In the Midst of a Housing Bubble? 20 Apr Are We In the Midst of a Housing Bubble? A decade after the housing bubble burst, sending the U.S. into the Great Recession, economists, investors, and homeowners alike are wondering whether we’re heading in the same direction. With home prices skyrocketing and supply unable to keep up with demand, deja vu is understandable. On the other hand, the National Association of Realtors reported that home sales bounced back in February after two straight months of decline, thanks largely to a healthy economy and labor market. Additionally, although home prices are up 6 percent from a year ago, which marks the 72nd straight month of year-over-year gains, the amount of available homes is 8.1 percent lower than a year ago and has fallen year-over-year for 33 consecutive months. The reality is that there are many factors at play that vary from market to market, so the question, “Are we in the midst of a housing bubble?” is a tough one to answer. When housing prices start to ramp up because of demand, and demand is met with a limited supply, you’ve got a housing bubble. Eventually, demand decreases or stalls at the same time that supply increases. 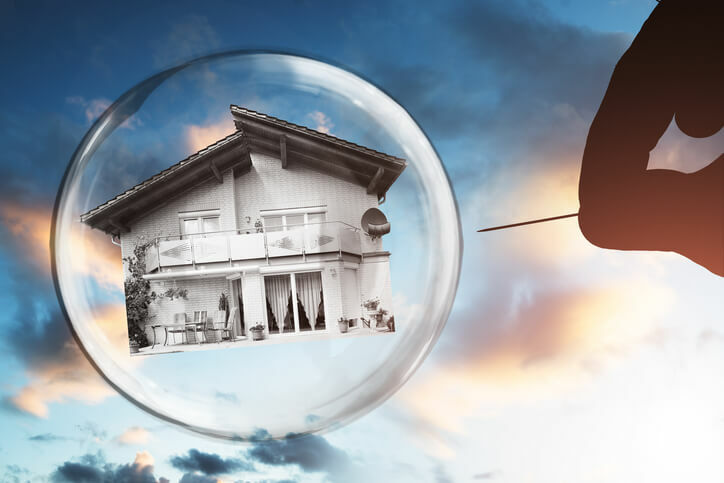 Home prices drop drastically and pop—the bubble bursts. This is precisely what happened when housing prices spiked 124 percent: Supply exceeded demand, and the housing market crashed in 2007, culminating in the Great Recession. Even as national home prices continue to appreciate, homebuyers in many markets, especially those who already own a home, are opting to stick with the house they have rather than trade up, and there are many reasons for this. Economists and realtors have been looking more and more to millennials, who are more enthusiastic than ever about real estate as an investment and represent more than 75 million potential homebuyers. Additionally, as millennials get married and start having children, the trend has been to leave urban life in favor of suburbia—in 2017, suburban population growth outpaced urban growth for the first time this decade, according to the Brookings Institute. This second wave of suburbanization means more single-family homes and fewer apartment complexes, which theoretically means more millennial homebuyers are being a boon to the housing market. However, for 83 percent of people ages 22 to 35, student loan debt is actually preventing them from becoming homebuyers. For individuals who have student loan debt, their credit scores are suffering, a decent down payment is impossible to come by, and the fact that banks focus on how much you owe, instead of how much you make, means fewer millennials are able to become homebuyers. "Student loan debt holders do want to own a home, that's part of their American dream," said Jessica Lautz, managing director of survey research at the National Association of Realtors (NAR). "It's just really hard to get there right now." Does the Market Make a Difference? Although the housing market overall has recovered the $9 trillion lost in home value during the Great Recession, according to Zillow, and more than half of the biggest housing markets have recouped the value they lost, many markets haven’t fully recovered. The S&P CoreLogic Case-Shiller Index, which keeps tabs on home prices, has reported that the index reached a post-Great Recession high of more than 184 in September—a level last seen in July 2006, shortly before the housing bubble popped. And although in certain markets it feels like home prices continue to rise astronomically every day, in other markets, recovery is still slow. In fact, according to the NAR, although there were sizable sales increases in the South and West of the U.S. in February, those increases were offset by declines in the Northeast and Midwest. For example, Seattle, Las Vegas, and San Francisco continue to post double-digit increases, while cities like Denver—which used to top the list—are slowing down. Even still, home prices in Denver have risen 65 percent since 2012 compared to the national rate of 38 percent. At the end of the day, real estate is local and no one can say with 100 percent certainty whether we’re currently in a housing bubble. The mortgage industry has reformed drastically since 2008—for better or for worse—and although there may be some periods of slowed housing market growth nationally, what is happening in individual markets is what determines whether there is housing market growth or a looming recession. On the fence about whether to invest and how to quickly and effortlessly find the best investment properties? Join us for a live Deal Finding Friday session to see how Privy can give you the confidence to invest.